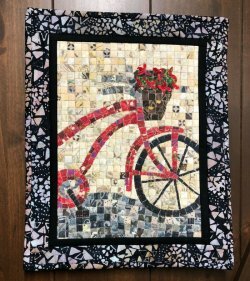 This month’s mosaic project was created by Cheryl Lynch. She was inspired by a trip to Israel where she saw mosaics everywhere! Cheryl created the look of stone with fabric using an overlay of netting and small squares of fabric.